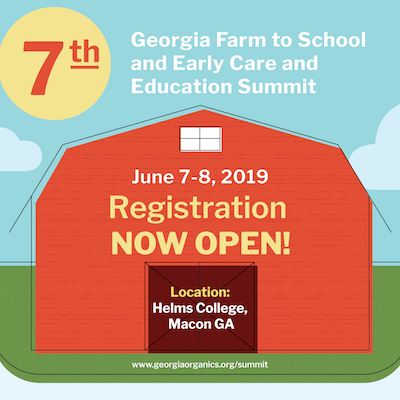 The 7th Georgia Farm to School and Early Care and Education Summit will be hosted on June 7-8, 2019 at Helms College in Macon. The Summit includes hands on workshops, field trips, and education sessions and networking opportunities. Click below to register for the Summit. To view more information on the Summit, please visit the website or contact Georgia Organics Farm to School Manager Abbie Chaddick at abbie@georgiaorganics.org or 404-481-5015.